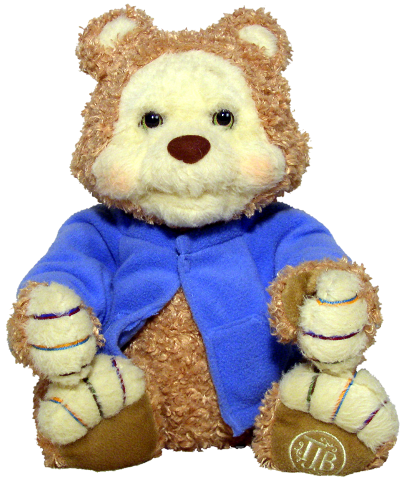 TJ is like Teddy Ruxpin's younger cousin. As a younger cousin, TJ is more articulated, more entertaining and, dare I say it... so much cuter! Like Teddy, however, TJ is not much for cuddling - he is even more rigid and bulky than Teddy ever was. And while I have heard (or rather read) that he can take a fall out of the bed without blinking, I'm not really convinced of that. He just seems like he would be more delicate than Teddy. TJ moves his mouth and blinks his eyes like his older cousin Teddy, but he also moves his arms up and down, nods his head back and forth and even wiggles his ears. Now that is some impressive articulation! I found out that there were two versions of TJ. As you can see from the pictures above, the one on the left (mine) has a sweeter-looking disposition, whereas the one on the right (my dad's) looks more gruff. The initialization routines are different as well. 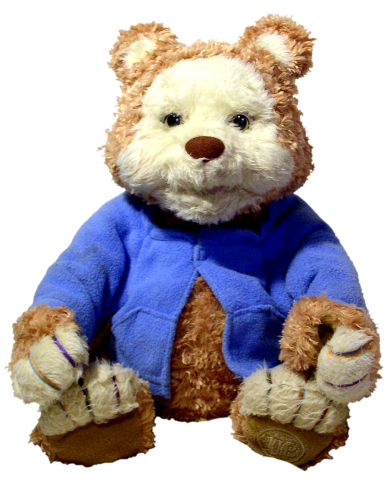 The sweet bear moves his head up and down as part of his startup, but the gruff bear does not.